Lindsay: The Bandas Space by Patricia Urquiola has been on my radar for a while and I loved it even more once I saw it in person at HD Expo. This modular system can be adapted to any personality, space and mood by mixing and matching the seating components with 'rugs' which attach to the furniture with velcro. The rugs can be switched out at any time allowing you to change the appearance of your space at any time. Debra: The Cloud by David Trubridge is a seemingly weightless cloud-like pendant make from a spiral twisting skin. 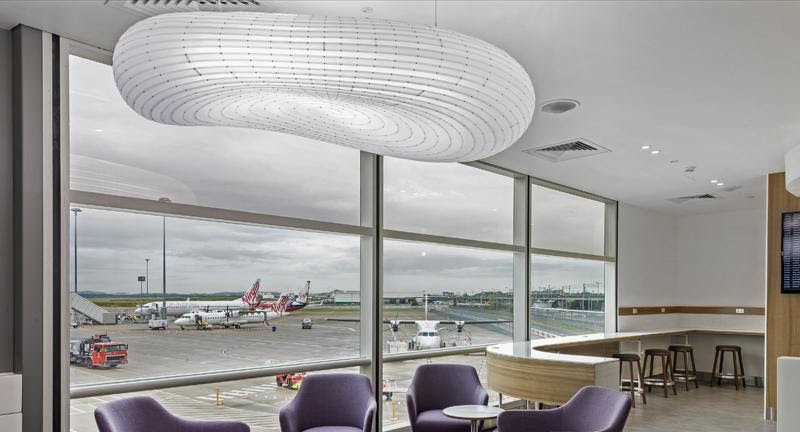 This fixture is perfect to use as feature pendant in a lobby or public space. Julia: My favorite new find from HD Expo was Allison Eden Studios. Allison creates handmade custom glass mosaics that can add an extra layer of glam to your interior. Every project is unique and her designs range from bright and quirky, to sophisticated and sultry. When you need that extra special wall finish, this could be the perfect solution. Susan: GEMMS Marcasite by Natural Veneers are feather light wood mosaics inspired by the traditional Japanese art of folding paper to create unique shapes and figures.